Everybody knows how dangerous UV rays can be for the skin. A vast majority of people would never go to the beach or walk around on a hot day without a suitable high factor sun cream. But what about our eyes? 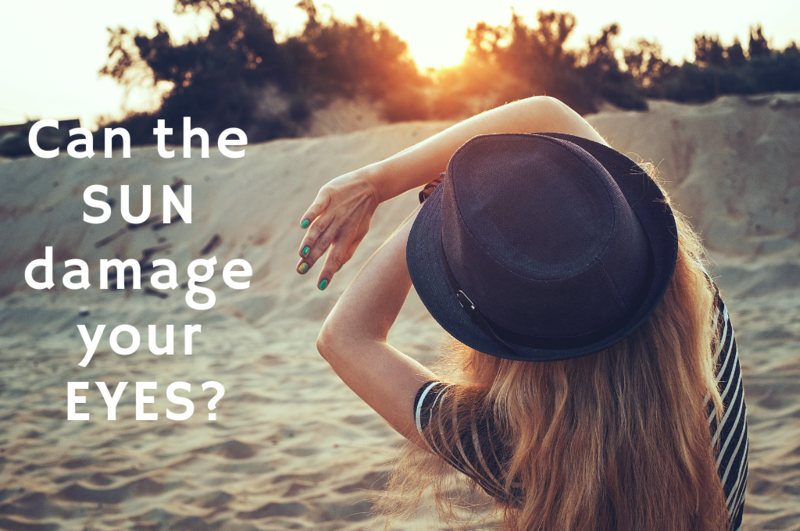 Does the sun damage your eyes, too? And if yes, what can we do to protect them? Ultraviolet radiation is the name given to a group of rays that are invisible and are emitted by a variety of different objects including stars and planets. The main source of ultraviolet radiation on earth is from the sun. UV radiation is part of the Electromagnetic Spectrum which is a range of rays arranged in order of their wavelength with the shortest wavelengths displaying the highest level of energy and the longest wavelengths the lowest level of energy. Going from shortest to highest wavelengths they are arranged in the following order: Gamma rays, X-rays, Ultraviolet, Visible light (each color has a different wavelength), Infra Red, Microwaves and Radio waves. Our eyes are magnificent organs. In order for us to see, the cornea (the see-through dome that covers the iris and pupil) and the internal lens (that sits behind the pupil inside the eye) need to be transparent. While this allows light to get through to the retina at the back of the eye, it also means that more harmful ultraviolet rays can also get in. In fact, the eye is the only place that light and ultraviolet rays can get inside the body. In order to best protect the eye from harmful ultraviolet radiation, it is deep set within a bony structure known as the orbit, it has brow and eyebrow hair overhanging it, as well as the ability to screw up the eyelids to reduce the amount of rays entering the eye. 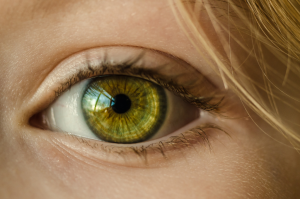 The iris muscle also has an amazing feature that means that the more visible light is shone into the eye, the more the muscle constricts, making the pupil smaller and thereby reducing the light that can get in. Of the ultraviolet radiation that does get past these natural barriers, different types of UV rays affect different structures of the eye. There are different types of UV rays and they are categorized according to their wavelengths. Very short wavelength UV rays (from 100 to 280 nanometers) are categorized as UV-C rays and although they are the highest energy UV rays and probably the most dangerous to us. They are filtered out by the ozone layer and water vapor in the upper atmosphere and therefore never actually reach us. Of the UV rays that do reach us, the wavelengths from 280 to 315 nanometers are called UV-B radiation. While most of these rays are also filtered out by the atmosphere, a small percentage still make their way through to us (it is estimated that of the ultraviolet radiation that does reach the equator from the sun, 95% will be UV-A rays and only 5% will be UV-B) . It is these rays that are absorbed by the skin and cause sunburn and skin cancer. The external parts of the eye, including the eyelids, sclera (white of the eye), conjunctiva (transparent membrane that cover the sclera), cornea and (to some extent) the internal lens all absorb these UV-B rays and they do not reach the back of the eye. In many ways this is good news as these rays are powerful and could have a much greater and more devastating affect if they reached the retina. The downside is that the UV-B rays that are absorbed can change and damage the structure of these external organs. The final category of ultraviolet radiation is UV-A rays. These are the least powerful range of UV rays, with wavelengths ranging from 315 to 400 nanometers, and they are the closest rays to the blue/violet end of visible light. Even though these rays have less energy and are therefore less powerful than other UV rays, since they are not filtered out by the external eye, there is nothing stopping these rays from reaching the retina at the back of the eye. When the retina is exposed repeatedly to UV-A radiation, it will unfortunately undergo negative changes. Most people, even people who are using good quality and high sun protection factor sunscreen, will be rather tentative when placing cream around the eyes. Although there are some sunscreens that have been developed specifically to stop the cream liquefying and leaking into the eyes, most still do and this causes anything from mild discomfort to intense stinging and redness. Because of this, the skin around the eyes and the eyelids themselves are very susceptible to the effects of UV-B radiation. This includes wrinkles, skin discoloration, signs of aging and of course skin cancer. In fact, according to research conducted by the Skin Cancer Foundation, a massively disproportionate 10 percent of all skin cancers are found on the eyelids, most of which are basal cell carcinomas. Basal cell carcinomas are growths that start in the basal cells which line the deepest layer of the outermost part of the skin, known as the epidermis. Although they are cancerous, basal cell carcinomas usually do not spread to different organs of the body. However, if they are not dealt with promptly, they can grow and cause disfigurement. The conjunctiva is a transparent membrane that covers the white of the eye and also the inside of the eyelids. The area of the conjunctiva that is visible when the eyes are open is susceptible to change due to absorption of UV-B radiation. The most common change seen is the development of a pinguecula, a yellowish bump, often triangular in shape, near the cornea, more commonly on the nasal (or nose) side of the eye. A pinguecula is normally asymptomatic (has no symptoms) but occasionally it can cause dry eye or be unsightly. Less common is the development of a pterygium where a layer of fibrous vascular tissue begins to grow from the conjunctiva over the cornea. Although more noticeable than a pinguecula and more likely to cause dry eyes, it still will often not need treatment or surgery unless it covers the pupil, thereby obscuring the vision, or starts to distort the cornea. One of the most painful results of ultraviolet radiation on the eye is photokeratitis, a severe inflammation of the cornea which is essentially a form of acute sunburn. People who get this complain of excruciating pain which can last a couple of days and sometimes be accompanied by complete but temporary loss of vision. It is more common among people who have spent long hours in the snow at high altitude (e.g. skiing) or on the beach without any form of UV eye protection. The white bright surfaces of the snow and sand reflect the UV light upwards and therefore the eye is ‘attacked’ from both above and below. Because of this, photokeratitis is sometimes known as ‘Snow-Blindness’. Despite the intensity of the pain and the vision loss, photokeratitis is temporary and within a few days, the person should be back to normal. 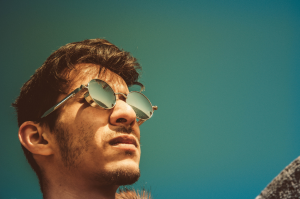 Nevertheless, there is evidence to show that repeated exposure to UV radiation can cause slow but progressive structural changes to the cornea – meaning that in the long-term the cornea becomes less transparent, which will obviously affect the clarity of vision. Just behind the iris (the colored part of the eye) and the pupil sits a lens which is completely transparent when we are born. As a person ages, this lens begins to yellow and eventually go cloudy. When the lens is cloudy enough to affect the person’s vision this is called a cataract. Cataracts are the biggest cause of poor vision in the world today, although, except in extremely underdeveloped areas of the world where there is little access to medical treatment, there is a comparatively straightforward operation to remove the cloudy lens and replace it with a new man-made transparent lens, following which the vision will normally improve greatly. If surgery is not an option, those with cataracts can always wear prescription eyewear or contact lenses that effectively correct vision problems. Although the concept of cataracts is fairly well known, what is not so well known, however, is that it is estimated that about 20% of cataracts are due to ultraviolet radiation exposure and even when not, it seems that being consistently in the sun without protection speeds up the natural aging process of the lens. The retina is the layer on the inside of the back of the eye. It contains cells that are light sensitive known as rods and cones which send electrical messages back to the brain when they are hit by light. The brain then organizes the information it receives leading to the person being able to see an image. At the very center of the retina is a small region known as the macula. This region gives us our very central and sharpest vision. The most common cause of blindness in the western world is a disease known as age-related macular degeneration (or AMD) where this central area becomes damaged either due to a build up of waste material or the growth of new unstable blood vessels that start to leak. Studies show that people who were exposed to regular UV radiation at a younger age have a considerably higher chance of developing AMD later on in life. Another consequence of ultraviolet radiation on the retina, although much rarer, is retinal cancer. As opposed to cancer of the external skin, retinal cancer is much more dangerous, usually melanomas that can metastasize. Because of this, if a person does develop a retinal melanoma it needs to be surgically removed with devastating effects. Retinal melanomas are extremely rare with an estimated 3000 new cases every year across the United States, however because the consequences are so severe on the eye and possibly life threatening, since it is something that we can prevent by just taking a few precautions. After all, we should do our best to look after ourselves! The first step is to get good sunglasses that completely block out 100% of both UV-A and UV-B rays. Surprisingly, not all sunglasses are UV protected. People assume that the darker the lens the better the protection, however all it means is that visible light is being blocked, not ultraviolet light. In fact, if you have a dark lens without UV protection it is actually worse than not wearing sunglasses at all. This is because without the sunglasses the person will naturally screw up their eyelids to cut out some of the rays and the pupil will constrict to a smaller size. With the sunglasses on, the person will not have to ‘squint’ and the pupil will be enlarged, letting through even more dangerous UV rays! Sunglasses should have clear labeling that tells you whether it is UV protected or not. If you are unsure, a quick trip to your Eye Doctor or Optometrist should help as most have a machine called a spectrophotometer which will tell them whether ultraviolet rays are getting through or not. The second step is to actually wear them! So many people own a good pair of sunglasses but don’t end up wearing them, or only consider wearing them when they are in extreme sunlight e.g. on the beach, without realizing that the constant UV exposure they are getting every time they are outside, slowly accumulates until it has an affect on the eyes. We need to realize that even in the shade, even on an overcast day, even in the winter, ultraviolet radiation is getting into our eyes! The shape and design of the sunglasses is also important. Obviously, sunglasses must be stylish (otherwise we would find it difficult to wear them!) but wraparound shapes or large lens sizes which cover a larger area will obviously afford better ultraviolet protection. Hats with wide brims or even a cap with a peak will go some way to protecting the eyes and at times when the UV index is particularly high it is recommended to wear both sunglasses and a wide-brimmed hat. However, a hat by itself is normally not enough because ultraviolet rays tend to bounce off surfaces and into the eye, even if their direct route is blocked. Bright and white surfaces like snow, water, and sand reflect the most, but even concrete, asphalt and grass will reflect a certain amount of UV rays up into your eyes. Many affordable contact lenses come with full UV protection and therefore, the cornea, intraocular lens , and retina will be protected when you are wearing them. However, they obviously do not protect the skin surrounding the eyes, the eyelids, and the conjunctiva. Using sunscreen on the eyelids and the skin surrounding the eyes is a sensible precaution against developing skin cancers like basal cell carcinomas. The problem that most people’s experience is that the cream liquefies and leaks into the eye causing irritation, stinging, and redness. However, there are some sunscreens that have been specifically developed to combat this problem and they can be especially useful at times when sunglasses are not appropriate or when the sunglasses do not fully cover the area around the eyes. Error: Error validating access token: Session has expired on Friday, 12-Apr-19 14:10:09 PDT. The current time is Sunday, 21-Apr-19 12:06:23 PDT.